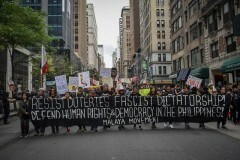 Hundreds march against Philippine President Duterte in NYC | Fight Back! New York, NY – On June 3, a contingent of 400 people marched in the Philippines Independence Day parade. The parade was a day for Filipinos in New York City to celebrate their homeland and heritage. 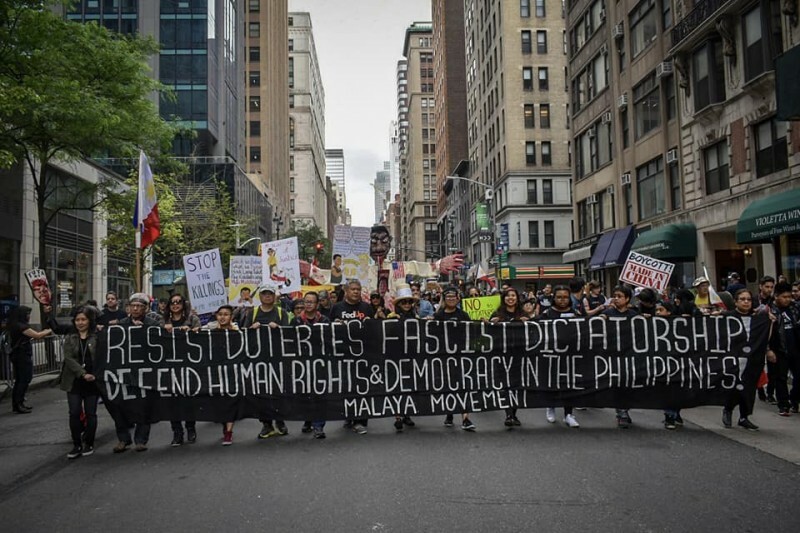 The Malaya Movement, an organization fighting for human rights in the Philippines, organized a contingent to march for human rights and democracy. At 400, this was one of the larger contingents in the parade. They proudly marched and chanted, demanding the ousting of Philippine President Rodrigo Duterte. While waiting for their time to march, several speakers riled up the crowd. “Women have suffered greatly under the fascist Duterte regime, dictatorship, in collaboration with imperialism. All these human rights violations are enforced by imperialism. The U.S. and the Duterte regime are collaborating to exploit the people, make themselves richer, consolidate power, and carry out ongoing wars of aggression,” said Zila Renfro, from the group Gabriela New York. When the Malaya Movement contingent began marching, a group of pro-Duterte people appeared at the parade. Though they were aggressive, they were vastly outnumbered and easily out-chanted. In the middle of the parade, at the location with the highest number of spectators, the whole contingent performed a one-minute die-in to display and reinforce the harrowing image of the thousands President Duterte has killed in his War on Drugs. At the end of the march, the anti-Duterte forces held a rally that loudly proclaimed the reason why they were anti-Duterte, why they demanded democracy, and why they were fighting for human rights. The rally ended with chants and lively discussions as those who joined from other parts of the parade discussed the event. The parade contingent is part of the build-up towards a rally at the Philippines Consulate on July 23, during President Duterte’s State of the Nation address. Organizers are hoping to double the numbers they saw at the parade.